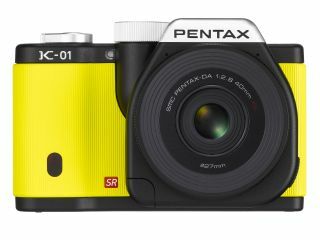 It's been a busy week here at TechRadar cameras, with launches coming early in the week from Nikon and Panasonic, but it was Pentax that grabbed all the headlines this week with its brand new compact system camera that has been designed by Marc Newson and is already causing a divide in the office. If you've missed any of the big news this week, here's a chance to catch up with everything that's been happening, each with links to the full story. Don't forget, you can join us over on Facebook and Twitter to keep up with all the latest news. It's been the biggest story of the week, as the new mirrorless camera from Pentax was finally unveiled on Thursday. Pentax first entered the compact system camera market with the Q last year, but the new camera is a much bigger offering and features support for existing K-Mount lenses. It's also been designed by Marc Newson, and its distinctive design is something we predict will either be loved or hated. Check out our Hands on: Pentax K-01 review with video to help make your mind up. It wasn't all good news this week for the company however, as it revealed that the Pentax Q had not lived up to expectations saleswise. Nikon refreshed its compact camera line-up this week, with a number of new models entering the range. These included the Coolpix P510, a 42x optical zoom bridge camera, the Coolpix P310, an upgrade to the high-end P300 camera and the Nikon Coolpix S30, a waterproof and shockproof camera that is the company's very first "family" camera. Last year, it was reported that compact camera sales had declined by around 30%, but that doesn't worry Nikon, the company told us. In fact, they say they're still growing in a shrinking market. No camera launches this week from Canon, but a new printer has been unveiled. The PIXMA MG4150 is a Wi-Fi enabled all in one printer designed to appeal to students and families. The release came in the same week as it was announced that Canon's President Tsuneji Uchida will step down, with his role being filled by the current CEO, Fujio Mitarai. Another company to unveil its spring range of compacts, Panasonic announced seven new cameras this week. These include the superzooms TZ25 and TZ30 and two new rugged cameras. Have a look at our Hands on: Panasonic TZ25 review and Hands on: Panasonic TZ30 review to get a closer look at two of the new compacts. After Polaroid announced its "smart camera" at CES 2012, we've been keen to find out if apps for cameras would be making their way onto other manufacturers' models. Olympus told us that apps were "on the list" and would eventually make their way onto cameras at some point in the future.... we'll keep our eyes peeled then. That's it for this week, next week we're expecting big things as the CP+ photography show kicks off in Japan. Make sure to stay tuned for all the latest camera news and reviews.